Pakistan vs Australia 1st ODI Highlights: Australia beat Pakistan in the 1st ODI on Friday by 8 wickets and take a 1-0 lead in the five-match series. 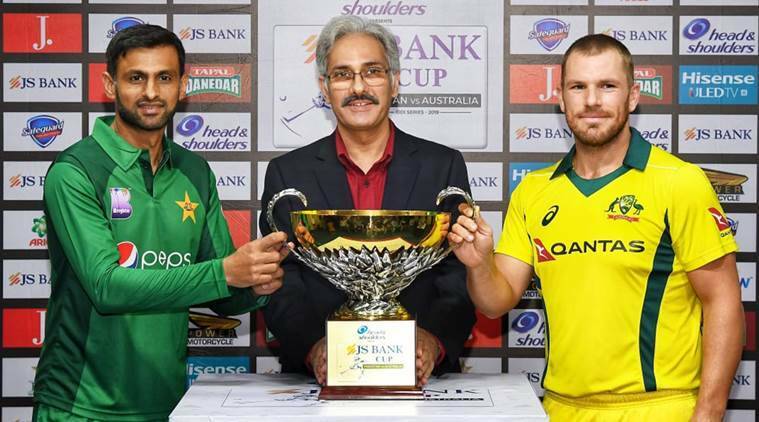 Pakistan vs Australia 1st ODI Highlights: Australia beat Pakistan in the 1st ODI on Friday by 8 wickets and take a 1-0 lead in the five-match series. Pakistan, who were without their regular skipper Sarfraz Ahmed, scored a challenging 280/5 after batting first. Chasing under lights, Australia reached the target with one over to spare. Shaun Marsh remained unbeaten on 91 while skipper Aaron Finch played a captain’s knock of 116. Both the two teams will look at this series as a platform to begin preparation for their World Cup campaign. This will be the final 50-overs series for both the teams before the World Cup tournament begins on May 23. A full toss and Marsh comes back for a two and victory for Australia. Celebrations all around the Aussie camp. Shaun Marsh remains unbeaten on 91. Earlier, Finch played a captain's knock of 116. Australia won by 8 wickets (with 6 balls remaining). Finch's superb knock comes to an end on 116. Just as we were saying how good a knock it was, the captain falls. Australia needs 46 from 45 balls. 34 ovs gone and AUS- 174/1. Australia in control. But one wicket could make this very interesting as they still need more than a run-a-ball on a surface that's not that easy to start on. Australia reach 150/1 and the runs/balls ratio is almost level: 131 needed from 129. Finch & Marsh the unbeaten pair. 100 comes up for Australia after 20 ovs. Meanwhile, 50 up for Aaron Finch! His first against Pakistan. Four of the last ball and Pakistan finish with 280/5 from their 50 overs. Haris Sohail remains unbeaten 101. Will it be enough? Stay tuned for the chase. 4 overs to go and PAK- 238/4. Faheem Ashraf and Haris Sohail are in the middle. Sohail is 3 shy from a brilliant hundred. Bang! Umar Akmal has just thumped 3 sixes in the over. He races to 32 and after 28 overs PAK- 133/2. Pakistan cross the 100-run mark. Haris Sohai and Umark Akmal steadied the ship after debutant Masood's wicket. Pakistan are 101/2 after 23 overs. Pakistan 63/1 after 15 overs, with the Aussies having already used three spin options. A good over for Pakistan as debutant Shan Masood comes on strike and decides to do something about the slow run-rate. That's three back-to-back boundaries off Richardson. 13 runs off this over. Imam-ul-Haq comes forward and slams it over long-on for a maximum off Nathan Coulter-Nile. Good shot by Imam. PAK are 10/0 after four overs. Imam-ul-Haq and Shan Masood are at the crease with the former on strike. Jhye Richardson will open the attack. A minute's silence has been observed for the victims of Christchurch terror attack. Pakistan skipper Shoaib Malik has won the toss and elected to bat first. Pakistan XI: Shan Masood, Imam-ul-Haq, Haris Sohail, Umar Akmal, Shoaib Malik (c), Faheem Ashram, Imad Wasim, Mohammad Rizwan (wk), Mohammad Amir, Yasir Shah, Mohammad Abbas. Australia XI: Aaron Finch (c), Usman Khawaja, Peter Handscomb, Glenn Maxwell, Marcus Stoinis, Shaun Marsh, Alex Carey (wk), Nathan Coulter-Nile, Jhye Richardson, Nathan Lyon, Adam Zampa. Hello and welcome to our live coverage of the first ODI between Pakistan and Australia. This is the final ODI series for the two sides ahead of the ICC World Cup 2019.